USA’s Chelsea Liu and Devin Perini perform their Short Program at the 2012 U.S. National Figure Skating Championships. When Chelsea Liu and Devin Perini captured the 2012 U.S. novice pairs title in San Jose this past January, it was not a huge surprise. The young duo, just 12 and 19 respectively, were the reigning silver medalists at the time. Now in their third season together, Liu and Perini have shifted their focus to the junior level, and are preparing to qualify for the 2013 U.S. Championships in Omaha, Neb. Liu uses the win as a source of inspiration, and has grown confident with the addition to her trophy case. Liu and Perini teamed up together two years ago—Perini was looking for a new partner after his previous partnership came to an end. Liu was returning to southern California after a stint in Colorado. Coaches Jenni Meno and Todd Sand brought the two together for a tryout. Liu was training in Colorado Springs with Dalilah Sappenfield and Larry Ibarra, and followed her sister, international competitor Chaochih Liu, back to the family home in Irvine. Despite the seven-year age gap, Liu and Perini have a solid relationship based on respect and friendship. Perini believes that Liu’s maturity on the ice is one of the reasons that they have come so far so early in their partnership. Liu added that persistence and a little humor help things along as well. Now as they enter their freshman year on the junior level, Liu and Perini understand that the game has changed. They have dedicated the off-season to growing their technical elements and attempting to develop their overall skating skills. To ease the transition, Liu and Perini have adapted their novice free skate from last season to the junior requirements, and have prepared a new short program to The Dueling Banjos, choreographed by Sand and Christine Binder. Liu and Perini have planned for increased technical content in their programs this season, and are working hard to include all of their new elements come Omaha. Liu and Perini have worked with Meno and Sand since the beginning of the partnership, and appreciate the wealth of knowledge that the three-time World Championship medalists bring to the table. 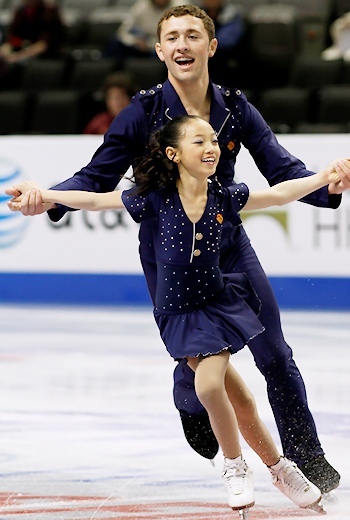 Since Liu does not meet minimum age requirements, an invitation to compete on the Junior Grand Prix will have to wait another year, however, the duo currently has the third highest summer competition score among American junior pairs teams. Perini is from Thousand Oaks, Calif., and graduated from high school in the spring of 2011. He is currently taking classes at Saddleback College in Mission Viejo. Outside of skating and school, Perini works part time at a tanning salon, and also works at his father’s company as time permits. The college student also likes doing things outdoors. “I love being outdoors—going to the beach, riding my bike, surfing, skate boarding—anything that my coaches don’t want me to do,” he said with a laugh. Perini has two brothers—older brother Dustin, who is an ice dancer, and a younger brother Dillin who wants nothing to do with skating. Liu will be a seventh \grader this fall, and is planning to enter an independent study program that will allow her to attend school part time. She enjoys gymnastics, singing, and acting. In addition to her older sister, she also has a younger sister named Cheyenne, who is eight years old. “She likes to skate, but doesn’t want to do it competitively. She doesn’t want a coach because she doesn’t want anybody to help her—she’s very independent,” she explained. Liu and Perini will next compete at the 2012 Southern California Inter-Club Association Invitational Series Final at the end of September in Paramount, Calif.